Jan gave this silk scarf to her mother many years ago as a gift from her journey to the New York Metropolitan museum of art. Now she has it back and wanted it framed as a memento of her. We used the same sticthing technique seen in Barney's video below to stretch it on acid free foam core and framed it under conservation glass. Now it will last for years to come. Barney brought us this White Bear Yacht Club racing flag to be framed See how we attached the flag without damaging it. Stained glass looks better in a frame. This frame is extra deep. Ray plans to put LED rope lighting in the frame behind the glass. I will try to get a picture of the backlit piece when he has it finished. 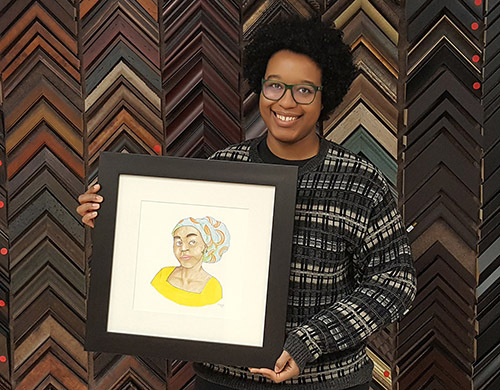 When Imani needed her art show entry framed fast we were able to get it done in time for the show. Jeff's mom saved this newspaper depicting the U of M Gopher football team. We scanned it and cleaned it up in photoshop before framing it. Now it should last for a hundred years or more. Thank you Jeff! Greg and Peggy just picked up their newly framed local art. The left picture is of the Cup and Cone in White Bear Lake. On the right is a commissioned print of Minneapolis highlights by Adam Turman. Thank you!! Dustin brought us this print depicting Norwegian Viking ships entering village port. He and his wife picked this up while on vacation. Now it is a priceless memory. Thank You Brian for giving us the opportunity to frame these beautiful Buddhist prayers. These were made by Brian's fathers monk. We have re-framed them in conservation materials. Now they are set to be passed down through the generations. Sometimes a simple frame is the best solution. Black (then new neutral) works wonderfully with the dark nature of this peaceful beach/ocean scene. The touch of gold warms up the beach beautifully. Our customer brought us this photo of the Opening Day ceremonies at Target Field April 12, 2010. We framed it in our 1.5" black budget framing material with red, white and blue mats to match the Twins colors and the flag being presented in the outfield. 1/29/18 Tru Vue museum glass is amazing. No glare, 99% UV light protection. Your art will last forever! Here is a quick video with Maurine O'Connor telling us why. 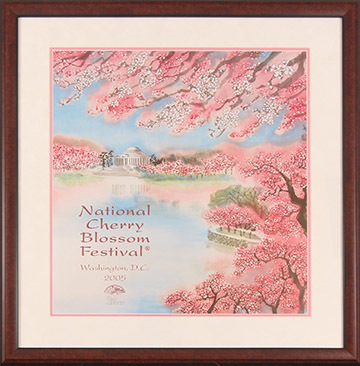 1/16/18 We framed a National Cherry Blossom Festival Poster in a mahogany red frame. The top mat is white suede and gives the blossoms a pearlescent feel. 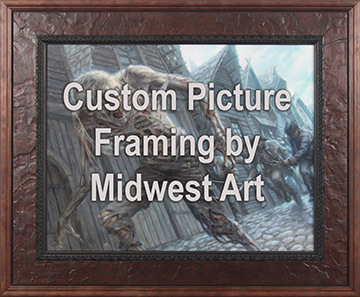 1/15/18 Custom frames for Magic the Gathering original paintings! I love my job! I get to see and work with so many amazing art pieces. 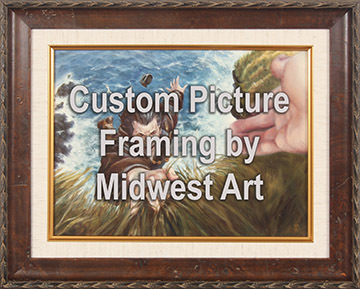 Last week we got to frame these original art pieces that were used in Magic the Gathering cards. 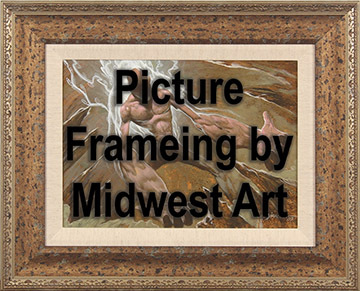 I have put a watermark over some of the image to avoid copyright issues, but I wanted you to see how we (the customer and I) used the frame to bring out and enhance aspects of the art we are framing. This frame was perfect because it has the exact color and texture from the coat worn by the man hanging from the cliff. I love how the mottled texture from the next image works with the rotting zombie flesh. The next image is a little small to see how well the frame works with the colors in the art. 1/7/18 World War II Pilot's log book in a shadowbox picture frame. Remember that World War II Airplane Propeller we did (see below). The customer has now given us the pilot's log book and some photos to frame in a shadowbox frame. This was fun!! The log book pages kept moving so we tied them down with clear fishing line. 12/29/17 One of our customers brought in this Army jacket from World War II. We framed it in a 1.5" deep Shadowbox frame and attached the photo in a way that would be non-destructive and nearly invisible. Thank you for the opportunity to frame this beautiful memory. 12/19/17 This beautiful Batik painting is sandwiched between two pieces of glass to show the art standing out from the wall behind. 7/17/17 This prop was part of a World War II air plane. It was a treasured memento in search of a way to be displayed. We painted and framed a piece of Masonite and attached the propeller. Now this memento has become a piece of art! 7/14/17 As you may know we print fine art and photography. So, I get this question a lot. "Can you print this great shot I took with my phone?" The answer is always "Maybe, it depends upon the camera settings you used and the condition of your lens when you took the shot." Then I always suggest that people should keep their cameras set at the highest resolution possible. To do that, google "your phone name" with "camera resolution settings" and follow the directions. The other tip I give is, try to remember to huff on your lens and wipe it off on your jeans or another piece of cloth before taking the shot. We handle our phones all day and a stray fingerprint can smudge the lens and ruin a great shot. If you have a great shot and want to know if it is printable send it to me by email and I will let you know what we can do with it. 6/27/17 A customer brought us this unique 200-year-old religious painting featuring several scenes from the life of Christ and one of St. George and the Dragon. We stitched the painting to over-sized matboard and framed it. The finished size is 65" x 56". 6/16/17 This was brought in by a customer who wanted us to cut a mat for him. The bark on makes it quite unique. 5/27/17 Art A Whirl! Last weekend I exhibited some of my photography at Art A Whirl. Here are a few photos from the show. If you have never been to Art A Whirl I highly suggest going. There are something like 800 studios in northeast Minneapolis open to the public with amazing art everywhere you turn. It's a great way to spend a weekend. Art A Whirl is the Northeast Minneapolis open studio weekend for the spring and Art Attack is the fall version. Go visit Art Attack this November. My work is showing on the upper balcony. 5/21/17 Do you have a jersey to frame. We love framing Jerseys. 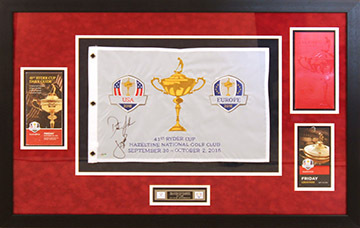 This Parise Jersey is now protected from the elements and easy to display in your mancave. 5/13/17 Did I ever tell you about the job we did for Jennie-O Turkey Store corporate offices? They had this long hall they wanted to decorate, and they wanted to tell the story of their inception. Katie Morgan of Interior Design Studio in Willmar, MN. came up with the design idea of having 22 pictures in a storyboard formation. The short pictures are 10" x 20" and the larger pictures are 20" x 20". Jennie-O Turkey Store dug through their photography archive and found these historical images. Katie worked with the team at Jennie-O Turkey Store to come up with the story that would be told about each panel. We then rendered the images to sepia (sepia is brown and white photography) added backgrounds and the text in photoshop. We printed the finished images on canvas and had them shipped to the install location. Below you can see the beautiful outcome. 5/2/17 This was a fun job. We made a giant 48"x71" framed logo shield for the UPS conference room. We started with a piece of 4x8 plywood. It was painted ivory. Then we glued the UPS logo to the plywood. The letters were purchased online and attached to the board. We used Museum Glass to cover the piece and keep the dust out. The frame is from Larson Juhl and has a slight curve with a matt black finish. We love these interesting jobs. 11/3/16 Ryders Cup collage framed in a red suede mat. The flag is stitched to the mat so the whole thing can be seen.